Battle of Vouillé (507) - War was virtually a constant after the Fall of Rome in 476. New European kingdoms were springing up in former Roman territory vying for as much land as they could grab in these early years of the Medieval Period. It was a time of powerful warriors commanding their clans, and of great rivalries. 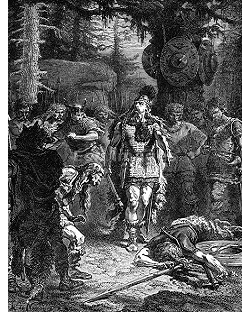 In Italy, Theodoric the Great and Odoacer had been battling for control of the peninsula. Meanwhile, an even bigger conflict was playing out in southern Gaul. The leaders of two emerging empires were both competing for the same piece of land. It was the Franks versus the Visigoths. It was Clovis versus Alaric II. It was the Battle of Vouillé in 507. 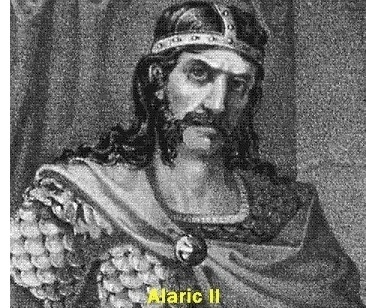 Clovis, was the founder of the Merovingian Dynasty (see Clovis above), and Alaric II was the great-grandson of Alaric I, who famously sacked Rome in 410 (see Rome Sacked again). Unfortunately, the account of the battle is very incomplete, so we don't know exactly how it played out. Here's what we do know, according to Gregory of Tours, and Jordanes, the two recorders of the event (both of whom are sources for the Goths and Franks, as noted above under Clovis I and Theodoric the Great). Clovis was the aggressor, crossing the Loire River (the border between the two kingdoms) in the Spring of 507. Besides the obvious jostling over territory, there appears to have been a religious motive for the conflict as well. Clovis was Catholic and Alaric was Arian, which was a major source of friction at the time. They met at a location about 10 miles (16km) outside of Poitiers (not far from the spot where the more famous Battle of Tours was fought 225 years later). The actual details of combat are awfully thin. Gregory of Tours writes that one side preferred combat from a distance, suggesting the use of bows, while the other preferred combat at close quarters, but does not indicate which side preferred which. However, he writes that the battle resulted in the Visigoths fleeing the field, and the Franks giving chase. This suggests that the Visigothic army was likely heavy on archers, and the Franks were successful in closing the gap with minimal losses, forcing the Visigoths to flee. The most significant moment of the battle was the individual combat between Clovis and Alaric, in which Clovis struck Alaric down, killing him...(what I wouldn't give to know how the fight transpired). The other interesting piece of Gregory's account is how Clovis managed to escape death himself when attacked by two Visigothic soldiers armed with lances. He writes that Clovis' coat of mail armor, and fast horse were his salvation. He does not say whether this happened before or after he killed Alaric; however, my guess is that the Visigoths were trying to avenge the death of their king, and Clovis barely escaped with his life. The Frankish victory forced the Visigoths to abandon southern Gaul and gave the region of Aquitaine to the Franks. They may have gone even further, but a threat by Theodoric the Great to intervene on behalf of his Gothic cousins, forced them to halt their advance. This moved the border between the two kingdoms south to the Pyrenees, which is the border that exists between France and Spain to this day.